I absolutely love Bonaventure Cemetery, located in Chatham County, Georgia. The beauty of the grounds can take your breath away. Denise at the Graveyard Rabbit of Moultrie Creek wrote a post about the famous song man, Johnny Mercer. He was buried at Bonaventure. The post is entitled One for My Baby. Check it out! I would like to show you my favorite photo I took while visiting Bonaventure. I point it out because my Mom is the one who noticed the scene. We were standing in just the right spot to get some gorgeous stones, grand artwork, and beautiful landscaping in one shot. I need to go visit my Savannah cousins and do the cemetery tours with them. Did I mention they were in the monument business? They've got lots of great stories to tell . . . 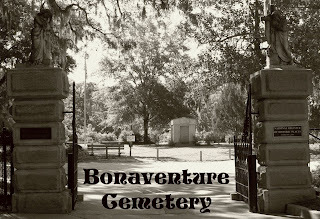 Thanks to you and Denise for these great looks at Bonaventure Cemetery. Your photograph is beautiful. Mercer was one of my favorites --- and his And the Angels Sing is tops!